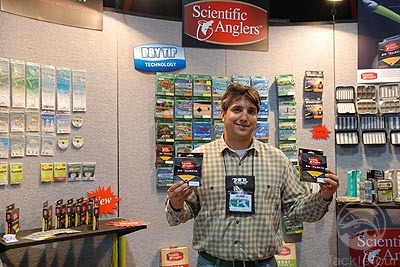 Introduction: We picked two of the most exciting fly offerings at the ISE Sacramento show, the first being the innovative new Sharkskin casting and flotation lines from Scientific Anglers, and the second being Sage's new fly offerings designed specifically for bass fishing... that's right, Bass. At Sacramento the Fly Fishing presence is so large that it gets an entire hall dedicated to the sport. 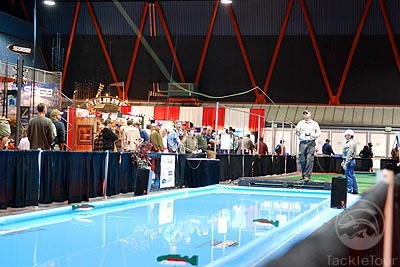 Centered around a test casting pond there are a ton of manufacturers and guides eager to share their wares and stories with you. 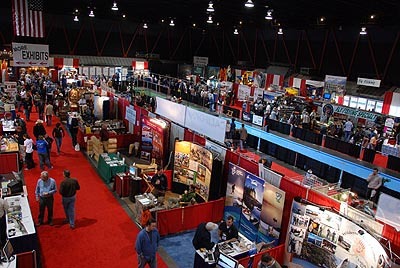 As we made our way around the hall there were a number of quality offerings, but not a lot of tackle that we could actually consider new. 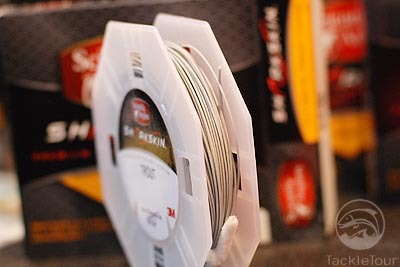 The reel manufacturers for the most part simply introduced more sizes rather than new additions to their lineups. You can always count on Scientific Anglers to come up with something exciting, as they spend more time and money on research drawing on their vast 3M resources. 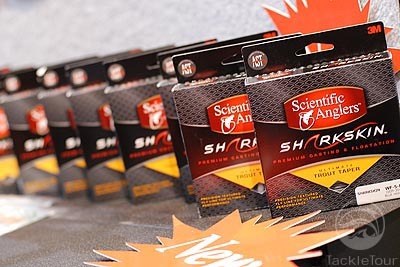 Scientific Anglers: At the show Scientific Anglers demonstrated their new Sharkskin lines which are designed to offer the ultimate casting experience. By modifying the surface of the fly line with a micro-repeating structure, it is possible to achieve surface interface properties that mimic nature such as the ability of insects to walk on water, the shedding and self-cleaning ability of Lotus leaves, or the adhesion that allows a gecko to walk up vertical surfaces. Scientific Anglers Sharkskin technology is a precise texturing process that embosses the surface of the fly line coating with a repeating geometric micro-pattern. The finished surface is no longer smooth, no longer exhibits unwanted line flash, and can be optimized via the engineered shape, depth, and frequency of the pattern to yield greatly improved line-to-water floatation, casting performance, and overall line suppleness and durability. The Sharkskin technology is a radical modification of typical smooth-surfaced fly lines, and introduces a micro-pattern around the entire circumference of the line. One of the pattern�s key features is that it changes the meniscus force balance that up until now, holds all other floating fly lines at close to a neutral buoyancy within the line-water interface�essentially � the line is above the surface and � the line is below the surface. The micro texture greatly increases the upward meniscus force through a combination of the water�s interaction with the new surface and the trapping of air into the valleys of the texture. The result is an over 200% improvement in resistance of the line to be forced into the water�.effectively improving �floatation� of the line significantly beyond anything that can be achieved through the addition of glass bubbles or surface chemistries. The line sits higher in the water resulting in less drag, easier mending, easier roll casting, easier pick-ups, and less water spray. So what are the real life benefits of Sharkskin on casting? Simply reducing running line diameters on weight forward (WF) lines has long been utilized as a way to reduce line friction in rod guides. However, reducing line diameter also reduces line durability, and increases the propensity for a line to tangle. Simple texturing of a fly line reduces the surface contact with rod guides during casting. Scientific Anglers introduced the Bonefish taper and other key distance-casting lines that utilize a braided monofilament core - modifying the surface of the running line, reducing the frictional interface during casting and resulting in the ability to shoot farther but with few tangles. The Sharkskin technology takes this a step further, allowing lines not made on stiff braided monofilament to have this shooting and casting advantage and the advantage extends to the belly and tip of the line, not just the running line. Because friction in the guides is reduced significantly, even when the line belly is in the guides, shoot distance is increased allowing longer, easier casts. Casters who also double haul find haul resistance reduced which results in easier, smoother hauls, even on hot days or when the line is dirty. This, along with reduced shoot friction, has resulted in increased test casting distance when compared to the exact same line without the Sharkskin texture. Distance increases compared to competitive lines without the advantages of AST, Sharkskin, and our new taper, will be significantly greater. Although these new lines excel at distance, the features that allow that distance make shorter casts even easier. Another advantage of this new technology is complete elimination of line �flash�. Most other lines have slick, glossy surfaces that reflect light and can �flash� in the air scaring spooky fish. 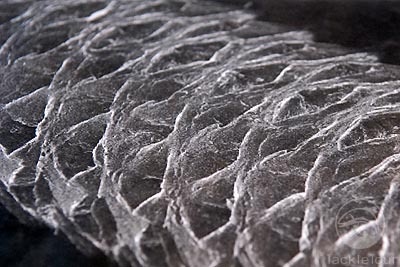 The micro-texturing process virtually eliminates surface glare, the finish is completely flat. When conditions are such that line flash is an issue, Sharkskin lines have an additional advantage over other lines. One would expect this change to the line to diminish the coating integrity and resistance to cracking. Scientific Anglers explained that in actuality, the opposite occurs. The engineered micro-repeating pattern effectively introduces flex points that increase the suppleness of the line and in lab testing, the durability and resistance to cracking is up to 3X greater. A good analogy is how a bicycle chain, although made of metal, bends due to flex points in the links.